Overlooking the Gulf of Salerno, 980 feet above sea level, the captivating Monastero Santa Rosa Hotel & Spa epitomizes idyllic luxury and history on southern Italy’s Amalfi Coast. Housed within what was once a 17th-century monastery, the 20-room hotel encompasses four levels of stone pathways and botanical gardens brimming with bougainvillea, roses, and lemon trees, and in its full-service spa, guests can expect an oasis of pure spirituality, complete with coastal views. Bespoke treatments celebrate Santa Maria Novella products; the spa is one of only a few Italian properties to offer the exclusive brand, created from native plants and flowers by Dominican monks since the 14th century. Neighboring the spa is a Technogym-equipped fitness center. A Mediterranean gastronomic experience headlined by a Michelin-star chef will also leave guests feeling indulged. The freshest local, organic ingredients of Conca dei Marini are fused in cuisine, as are herbs and vegetables from the hotel garden. 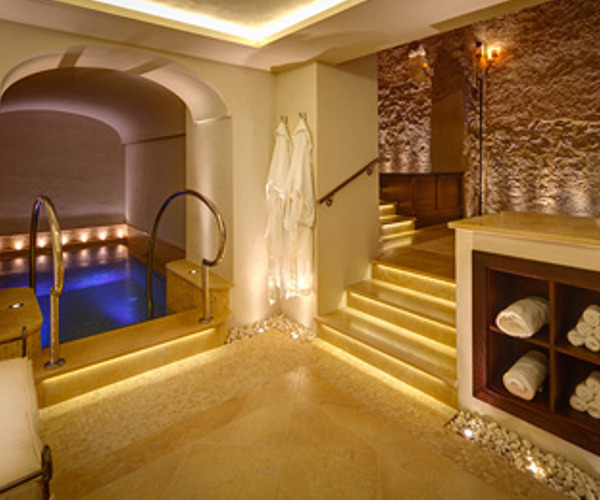 Within the original walls of a 17th-century monastery, the Spa invites guests on a tranquil journey of discovery. The dramatic esthetic keeps intact many elements of the original structure—domed ceilings, natural stone walls, and arched openings—while merging a contemporary design that forms a flawless flow among all wellness spaces. Treatment rooms include a "spa within a spa," forming a couple’s suite with outdoor pavilion, private grooming area, steam, and treatment garden; the thermal spa is an experience in itself, where guests can take their time utilizing such fixtures as the tepidarium, pomegranate-infused foot spa, rock sauna with crushed ice fountain, hydro pool, and mosaic-tiled experience shower. A custom-created menu influenced by the monastic inheritance comprises body treatments, chromatherapy, facials, rasul, hydrotherapy, massage, reflexology, and more. One of the signature rituals exclusive to spa guests is the 80-minute Candle Massage, which integrates an aromatic powder scrub of iris or bitter orange and a spice-scented candle wax crafted from pure plant oils and emollient butters. Lush landscaping and four levels of blossoming, manicured gardens intermingle with romantic, interwoven stairways and Amalfi Coast vistas to envelop Monastero Santa Rosa Hotel. Guests can stroll leisurely through the exquisite gardens, marveling at the 5,000 imported botanical plants and the authentic touches that pay tribute to the region, including pathways built from local stone, while breathing in the fragrant scents of bougainvillea, lavender, rosemary, roses, and lemon trees that permeate the air. Additional tranquility can be found playing quiet games of chess or cards in the cocktail area, or lounging on the sun decks, private cabanas, and canopied daybeds that dot the hotel’s grounds. Dramatically sculpted into the rock-base cliff of Monte San Pancrazio, above the Gulf of Salerno, sits the hotel’s infinity-edge pool. 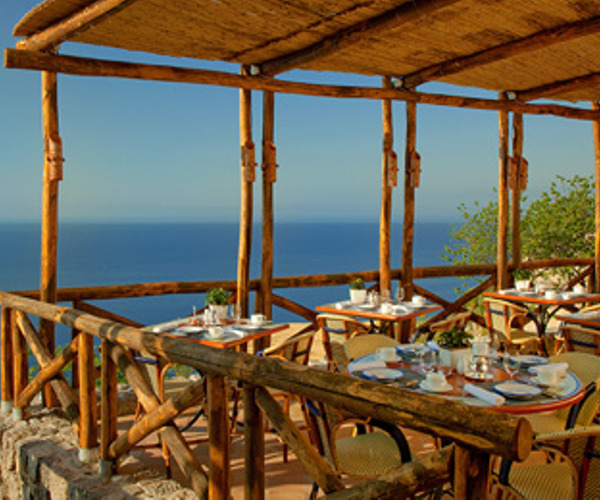 The 20 guest accommodations are striking, with vaulted ceilings, Italian antiques, and lovely balconies overlooking stellar views that expand from Conca dei Marini’s fishing harbor to Amalfi; the eight suites are fashioned in furnishings thoughtfully handpicked by the hotel owner. Each room takes its name from an herb the former Monastero Santa Rosa nuns would pluck from the monastery's garden and prepare in medicines, yet while the rich history is recognized, high-tech amenities, including high-speed Internet access, prevail. Ortigia bath products and Santa Maria Novella pomegranate salts provide a special touch. Enticing flavors and fresh ingredients, produce, and seafood from the Campania region await at the Ristorante Santa Rosa, where diners will feast on unique Mediterranean delights like crustacean-stuffed scorpion fish, homemade fusilli pasta with baby squids, and Monastero seafood salad. As discovered in many of the hotel’s spaces, lofty arched ceilings enhance the elegant dining area, and a pergola-shaded restaurant terrace, poised majestically over the Gulf of Salerno, welcomes guests to enjoy meals alfresco.